Let our courteous and professional drivers transport you in a San Francisco Charter Bus safely and comfortably. 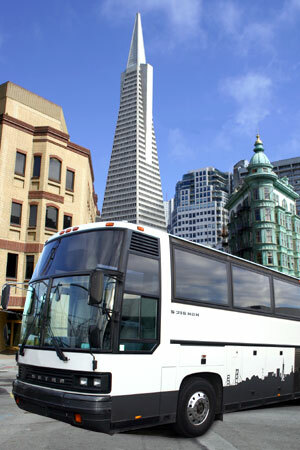 We can provide a variety of deluxe San Francisco charter busses for your San Francisco bus rental needs. The most modern San Francisco bus rentals, with the greatest availability are the full-size San Francisco motor coaches with seating for 40-49 passengers (40' coach), and the 50-58 passenger motor coaches in San Francisco (45' coach). 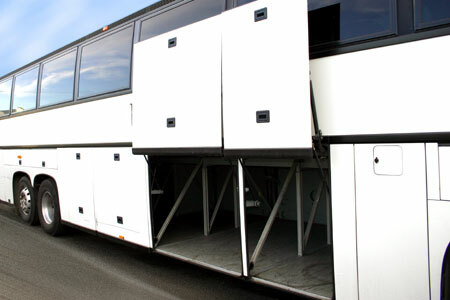 These bus rentals in San Francisco have spacious carry-on luggage space, tinted safety glass windows, reading lights, spacious reclining plush seating, climate control, clean restroom, large luggage compartments, video monitors (LCD on our newer buses), DVD and/or VCR and PA system, as well as air ride suspension for ultimate riding comfort. Radio and/or wireless communication is maintained between dispatch and between San Francisco coaches. We can provide your group with transportation services for your corporate event, wedding, tour or other social event. We provide San Francisco Charter Bus airport transfers, San Francisco hotel transfers, and cruise transfers to and from all local airports, including San Francisco International Airport (SFO), Oakland International Airport (OAK), Sacramento International Airport (SAC) and San Jose International Airport (SJC). Meet-and-greet services and hospitality desks are offered for client convenience - inquire for pricing. We provide vehicles for all San Francisco group transportation, including VIPs, conventions, and luggage transfers. Analyst roadshows, sales meetings, board meetings, incentive trips, company picnics, promotional shuttles, holiday parties and convention transportation, to name just a few choices. Weddings, birthdays, bar and bat mitzvahs, family reunions, camping trips, river rafting, picnics, holiday parties and private tours, or any other many transportation requirements. We can customize almost any tour to suit your schedule. We offer a range of options for groups. An expert local driver and guide will lead your sightseeing tour, providing you with safe and courteous service. If you desire, we can provide tours in Spanish, French, German, Italian, Japanese, Cantonese, Mandarin, Portuguese, and Russian – just contact us and we will locate the perfect guide. Our friendly, and knowledgeable staff can discuss custom tour options with you; we specialize in custom Napa wine country tours and breathtaking San Francisco city tours. Whether this is your first time here, or your hundredth, we can guide you in creating a unique sightseeing tour. Tailgate in style, as you enjoy the wealth of sporting events in the San Francisco Bay Area – NASCAR, San Francisco 49ers, Oakland Raiders, Oakland A's, San Francisco Giants, Oakland Golden State Warriors, Sacramento Kings, San Jose Sharks, UC Berkeley Cal Bears, Palo Alto Stanford Cardinals, and all the other great College and High School teams and competitions. We can also make arrangements for tickets to the games, as well as food and beverages to bring along. We can provide transportation to and from all San Francisco Bay Area Convention, visitor, and conference facilities. Check out San Francisco 's premier meeting and exhibition facility, The Moscone Center, and the adjoining Yerba Buena Center for the Arts and Yerba Buena Gardens. Visit San Jose 's Convention and Cultural facilities, including McEnery Convention Center, Civic Auditorium, Parkside Hall, Center for the Performing Arts, and Montgomery Theatre. All types of day, or multi-day, trips can be organized from start to finish. We can arrange for all your transportation, activities, meals, boxed lunches and even lodging, tickets, golf, gifts, and spa services. Our relationships with activity providers, restaurants, hotels and casinos, theatres and attractions, and resorts/spas can save you time and money, not to mention making your life easier by letting us coordinate and schedule all the details. 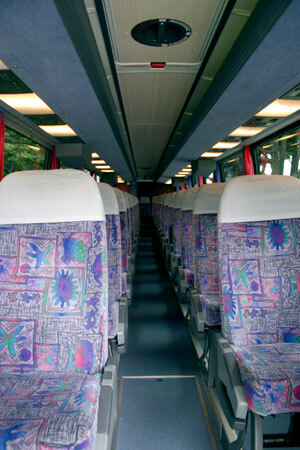 Please be advised that we offer a wide variety of San Francisco motor coach and other San Francisco buses for charter. 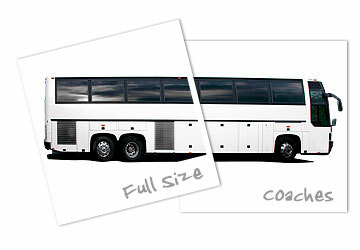 San Francisco Charter buses depicted are not necessarily the buses that will be provided for your charter. We offer a wide range of years, makes and models, including, but not limited to, Prevost, MCI, SETRA, Van Hool, Krystal and International vehicles. We may charge a premium to guarantee a specific year (or range of years), make or model of vehicle.